MTHFR is a gene and like all genes, it acts as a light switch – turning on or turning off various body processes. In this matter MTHFR takes folate (vitamin B9) and methylates (converts) it into methylfolate (5-methylTHF). This is a huge barrier for healing for many people including autistic children, sufferers of Lymes disease, and Chronic Fatigue. If you belong to an Autism, Lyme, Pandas, or Chronic Fatigue support group, Methylation (MTHFR) is the buzz word. Over the past decade MTHFR has been studied in terms of cardiovascular disease and cancer, but there is so much more. It also shows up often in children with developmental, neurological or behavioral symptoms and for those fighting chronic infections to no avail. If you study the methylation diagram below you can get an idea of why methylation is vital to disease prevention. Think of methylation as a kind of metabolism. Imagine the insides of a clock with many cogs, each cog regulating specific chemical reactions. These biochemical reactions occur in our bodies billions of times per second. If you look at the middle of the picture you will see that the MTHFR gene sits at a critical point. In the diagram above you can see the MTHFR gene is a vital catalyst. It creates the reaction and conversion of one chemical to the other. If you have a glitch that keeps this gene from doing its job, the reactions/conversions don’t happen properly or at all. Instead of the light switch being on or off, it becomes stuck in some sort of dimmer switch mode, functioning, but not nearly as well as it should be. This, not coincidently, is how a lot of people with the MTHFR defect feel – dim. The proper interaction of methylfolate and Methyl-B12 is what drives your body’s ability to fuel every cell in your body with energy (this is what’s going on in the diagram). Methyl-B12 regulates certain T-cells that play a role in some autoimmune diseases. Improper methylation also raises your levels of homocysteine in most cases (See the homocysteine part of the diagram above). This can greatly increase your risks for heart disease, stroke, macular degeneration, dementia and some cancers (e.g. lung, colon and leukemia). It also impedes your ability to manufacture glutathione (bottom right of diagram), the body’s master antioxidant (the “sanitation engineer”) that plays a critical role in autism treatments, chronic Lyme disease and some tick born co-infections. MTHFR literature also discusses the role of MTHFR mutations and increased miscarriages. Insufficient levels of methylfolate are linked to neural tube defects, which is why pregnant women are told to take supplements of folic acid. But if your body has a faulty MTHFR gene and can’t properly convert folate into methyl folate. 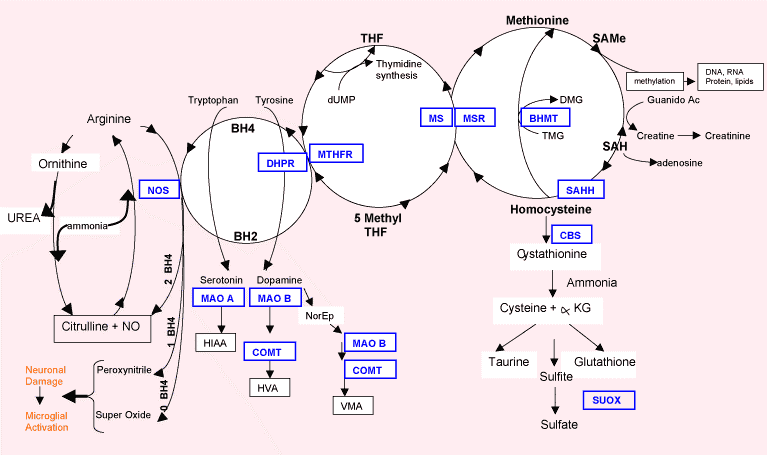 Looking again at the diagram above, notice the “BH4 cycle”. MTHFR plays a direct role in how well the BH4 cycle works – and the BH4 cycle controls those two neurotransmitters that are so essential to people with behavioral and emotional imbalances – serotonin and dopamine. One mutation on C677T means you’re probably methylating (converting) folate into methylfolate at 40-60% efficiency. If you have two mutations, that number drops to only about 10% efficiency. By following the arrow you can see the impact on the production/conversion of serotonin and dopamine and why knowing about this gene can be important to those who struggle with mood and behavioral disorders. In our office we also run neurotransmitter testing to detect low serotonin and dopamine. Finding and correcting the low lever has a huge potential impact for how some kids and even long term suffering adults might be helped. While MTHFR plays a large role in proper function of the brain and body the good news is that the effects of the mutated gene can be overcome with a methylated form of B9. At Infinity Wellness Center we offer the MTHFR genetic testing. Our doctors have seen huge healing strides when the MTHFR defect/s are supported. Both Dr. VanNoy and Dr. Wards have tested positive for mutations and their personal journeys have led them to get on the right supplements to heal themselves. Many offices charge thousands to test the MTHFR gene defects. We offer Genetic Testing in our office with the analysis for $705.00 through Genomix Labs. This it the preferable lab as it is the most time and cost effective. This test includes 55 possible SNPs, including both MTHFR SNPs. Click here to order your kit. To learn more about our lab listen to a podcast on Genetic Testing. ***We can analyze outside genetic reports such as 23 and ME (Only IF IT WAS RUN BEFORE SEPTEMBER 17th 2017) and formulate your specific protocol, it does take longer. This is a separate appointment listed in our scheduling software as 23 AND ME ANALYSIS APPOINTMENT. More info here.